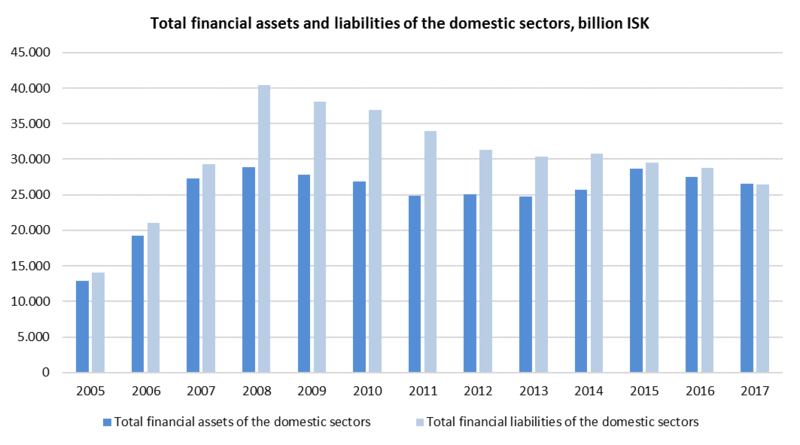 Total financial assets of domestic sectors in 2017 Statistics Iceland, in collaboration with the Central Bank of Iceland, is currently working on improving the methodology of financial accounts. An overview of the main changes can be found below. At this time we are only presenting the changes in the year 2017 according to the new methodology. A revision of the years prior to 2017, including an extension of the time-series all the way back to 1997, will be completed next year. Total financial liabilities of Iceland’s domestic sector stood at ISK 26,543 billion or 1,014% of Gross Domestic Product (GDP) in year-end 2017. Total financial assets stood at ISK 26,426 billion or 1,010% of GDP according to updated figures from Statistics Iceland. Financial assets of households stood at 6,909 billion ISK, while financial liabilities stood at 2,014 billion ISK at the end of 2017, or 264% and 77% of GDP, respectively. Financial assets of non-financial corporations stood at 4,458 billion ISK according to the revised data, while liabilities stood at 7,656 billion ISK. Total financial assets of financial corporations stood at 13,423 billion ISK, while liabilities stood at 14,465 billion ISK at the end of 2017. At the end of 2017, the financial assets of the general government stood at 1,656 billion ISK or 63.3% of GDP, while liabilities stood at 2,283 billion ISK or 87% of GDP. The foreign sector’s financial assets stood at 3,297 billion ISK or 126% of GDP, while the liabilities stood at 3,406 billion ISK or 130% of GDP. Debt securities other than shares (F.3) are estimated based on better data. Assets of non-financial corporations in this instrument class register lower on account of this. Counterparty data are used to a greater degree to evaluate the distribution of debt securities (F.3) and loans (F.4) between the resident and non-resident sectors. Debt securities other than shares (F.3) liabilities of the resident sector towards the non-resident sector register lower on account of these changes. Supplementary pension savings have been moved from currency and deposits (F.2) to insurance, pension and standardized guarantee schemes (F.6). This reclassification affects only the composition of financial assets of households and not the total value. Similarly it affects the composition of financial liabilities of financial corporations but not the total. Holiday allowance accounts have been re-estimated according to better data, leading to an increase in financial assets of households. Equity and investment fund shares or units (F.5) have been updated to better reflect market valuation due to improvements in source data. Holdings of households in this instrument register higher on account of these changes. The bulk of equities are not publicly traded so values are estimated according to book value from financial statements and tax data to a large extent. The sectors non-financial corporations, other financial intermediaries and captive financial institutions were reviewed. The next publication of financial accounts will be in September 2019. In place of the annual Statistical Series, a larger coverage of the main news will be provided in the next round of publication.